Another new design – and one we profiled earlier this year – is the new fluid end offered by Kerr Pumps. This fluid end (F1 Connect) is priced at $49,995 – this compares to pricing in the low $60k range for many competitor offerings. The company claims a traditional steel forging can yield two F1 Connect fluid ends vs. only one fluid end using the more traditional design, thus it could potentially take its pricing into the low $30k range (we don’t suspect this happens, however). While we cannot independently verify the quality of this product, Kerr noted its volumes are up y/y in 2018 and given growing demand, it expects to see higher volumes in 2019, potentially requiring further plant expansion. 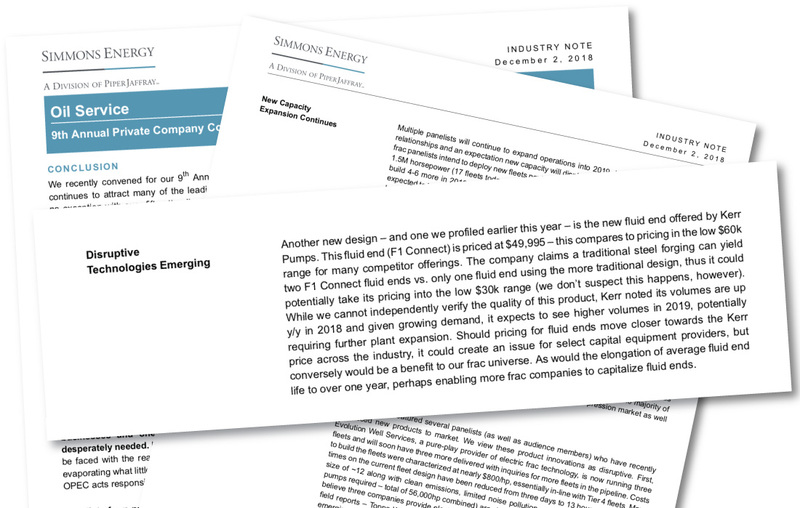 Should pricing for fluid ends move closer towards the Kerr price across the industry, it could create an issue for select capital equipment providers, but conversely would be a benefit to our frac universe. As would the elongation of average fluid end life to over one year, perhaps enabling more frac companies to capitalize fluid ends.